How Do You Answer Ocarina of Time’s Redundant Questions? All of the seasoned Ocarina of Time veterans out there will be familiar with all of Ocarina of Time’s redundant questions… assuming you know what I’m on about. I’m referring to instances such as when the Deku Tree asks “wouldst thou listen”, when Zelda asks if you’ll “please keep this a secret from everyone…” or when Nabooru asks “you wouldn’t happen to be one of Ganondorf’s…followers”. They are all redundant questions because regardless of how you answer, everything turns out the same. So how do you answer them? The right way, the wrong way, some other way. Let us know inside. Personally I tend to answer the questions the way you’re supposed to, because it just doesn’t feel right to do otherwise. It doesn’t seem heroic to be a punk little kid. There was one playthrough where I gave all of the wrong answers, and I felt dirty; not like a hero at all. 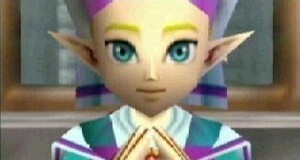 I didn’t want to listen to the Deku Tree, I didn’t want to keep Zelda’s secret and I was a Ganondorf follower. But all that did was lead to the Deku Tree telling his story anyway, Zelda asking me over and over until I agreed, and Nabooru seeing straight through my lies. I’ve never really seen the need for these questions; they just seem to slow things down. At least they aren’t confusing like Kaepora Gaebora’s. I can understand the reason for them if things differed depending on how you answered. Perhaps the question of Zelda’s trust would be more relevant if you later had chances to break it. Ultimately, the pointless little questions like these have become a part of Ocarina of Time that we love, and I’d hope we see them all again in the 3D remake. So how do you answer: righteously, or like a little punk?